Last week, while getting ready to climb a steep section of my route home, I vigorously shifted into my lowest gear while riding my 1987 Panasonic MC 7500 winter bike. That resulted in my chain over-shifting and falling into the spokes. Uh oh! It took about 15 minutes for me to dislodge the chain and ride home, after turning the bike upside down for diagnosis and repair. I had to remove my Paul’s chain keeper in order move the chain, as it had gotten wedged between the chain keeper and chain ring. Still, I wasn’t worried because I stopped the bike the minute this occurred, and didn’t expect that I had done much damage. I had built this wheelset about a year and a half ago using Quando cartridge bearing hubs, laced to SunRims CR18 rims. For the few weeks preceding this mishap, I had been hearing a clunking noise in the rear of the bike, occurring while pedaling and coasting, but louder when riding at speed. It took a while for me to clue in to what the noise might mean. At first, I thought it was the saddle rails or seat post, because I only heard it when working hard at accelerating. But then I began hearing it while coasting. Then I thought it was the replacement freewheel I was using – perhaps the freewheel cover plate was coming loose and the body was clunking around. Bicycle noises can be maddening to diagnose! When I finally had time to get the bike into the shop stand, I was saddened to see that the chain had damaged all the drive side spokes in my little mishap. Doh! Good thing I checked. So, I proceeded to disassemble the wheel, all the while wondering whether I had the right length replacement spokes (that’s why you always buy extras…), and questioning whether I was up to a wheel building experience on this nice sunny afternoon. Once I had the spokes out, which I removed very slowly and methodically (spokes under tension are dangerous projectiles), I examined the hub body. It looked pretty good. Okay, let’s build the wheel again with some new spokes. Fortunately, I had 9 spokes on hand of the exact length needed. In a sort of thoughtless way I began turning the hub axle, perhaps in an attempt to delay the inevitable. That’s when I heard a strange grinding/clicking sound. I held the hub close to my ears to listen further. Finally, the sound stopped, but was replaced by a very tight spot when turning the axle of the hub. Very tight. Not normal! The source of the clunking was now illuminated. But, what to do? I could attempt to diagnose the cartridge bearings, or I could try to find the right rear hub with 126mm rear spacing (mission impossible?). The latter turned out to be the best course of action. 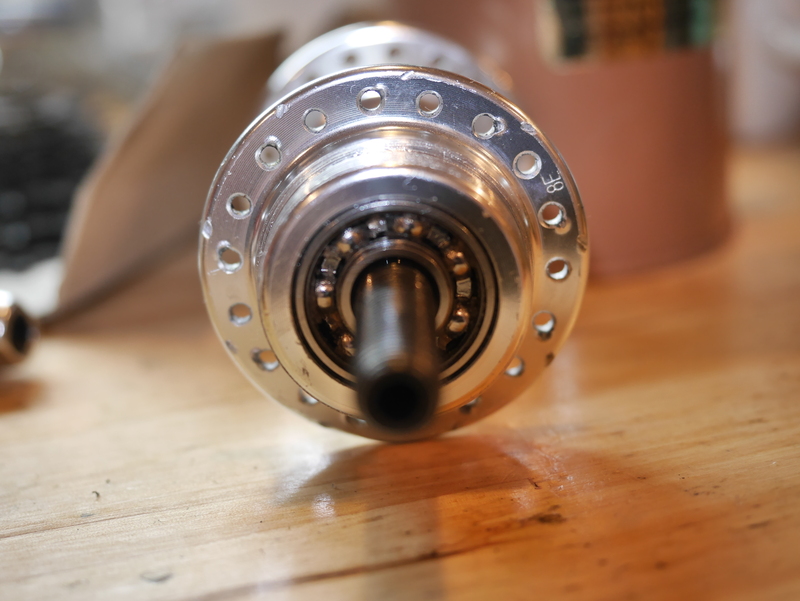 Velo Orange sells a 126mm rear hub with freewheel threads and 36 holes – just what I needed. Mission accomplished. Meanwhile, I removed the dust covers on the Quando hubs. Perhaps with this winter’s especially rainy and muddy rides, bad stuff had made its way into the cartridge bearings and could be simply cleaned out. No such luck. The bearing grease (which has been removed in the above photos), was pristine. Undaunted, I decided to clean the bearings and re-grease them, to see if by some chance that would change the hub’s tight spot (which was illogical of course). The bearings on these Quando hubs are either bad, or not properly adjusted, or the races and cups in the hubs are damaged. Cartridge bearings do not work in the same way as cup and cone style bearings. The latter’s adjustment is achieved by the correct position of the cone against the cup, something most experienced mechanics can do easily. Cartridge bearings are engineered differently. 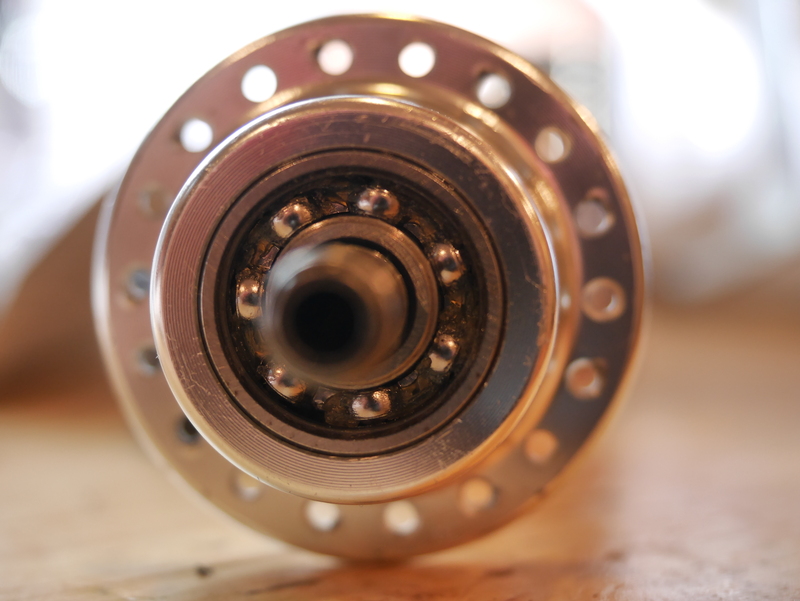 The preload adjustment is done by the factory when the bearings are pressed into the hub. If it is wrong, correcting it can be a problem. 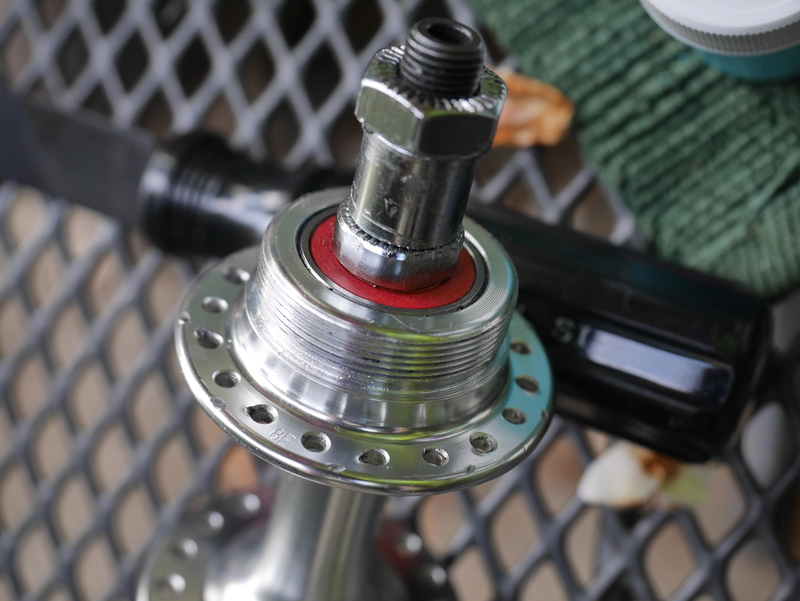 A cartridge bearing hub’s races can also be damaged by improper installation (or removal). While it may be possible to have these hubs diagnosed and repaired by a mechanic with the right equipment, the cost to do so is not justified here (throwaway technology strikes again). Now, I will try to look forward to rebuilding the rear wheel with my new VO hub, when it arrives. The front hub spins just fine and has no issues, for now. But, given this experience, I will plan to monitor it in the future. 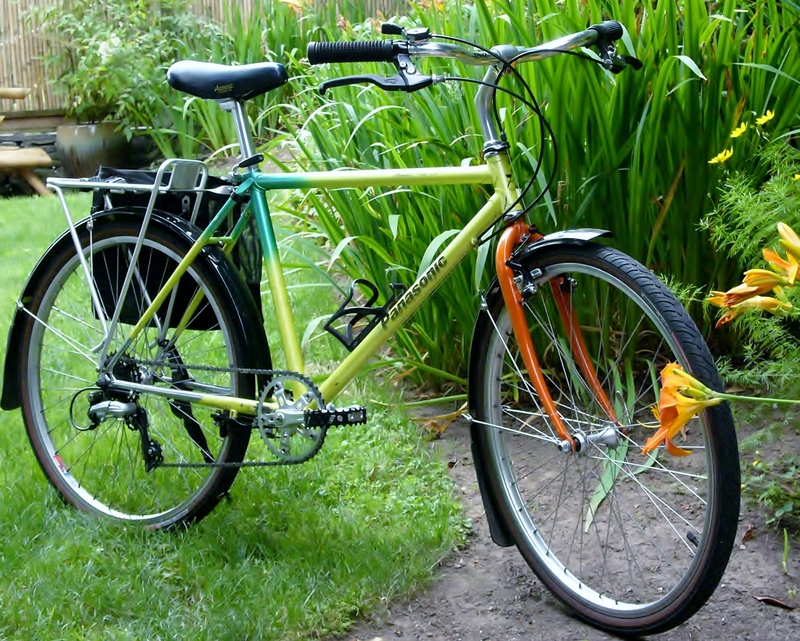 This entry was posted in Bicycle restoration, Commuter bicycle, Freewheels, town bike, wheel building and tagged 126mm rear spacing, bicycle restoration, Mountain bike, Panasonic MC 7500, Paul's chain keeper, Quando hubs, Sunrims, winter bike by Nola Wilken. Bookmark the permalink. I have a steel Quando ball-bearing road hub on one of my front wheels. It has been a good hub. It has been a good hub, but when I bought it, I noticed that the grease was kind of a crappy amber goo, so I stripped the hub and filled it with Lubrimatic. 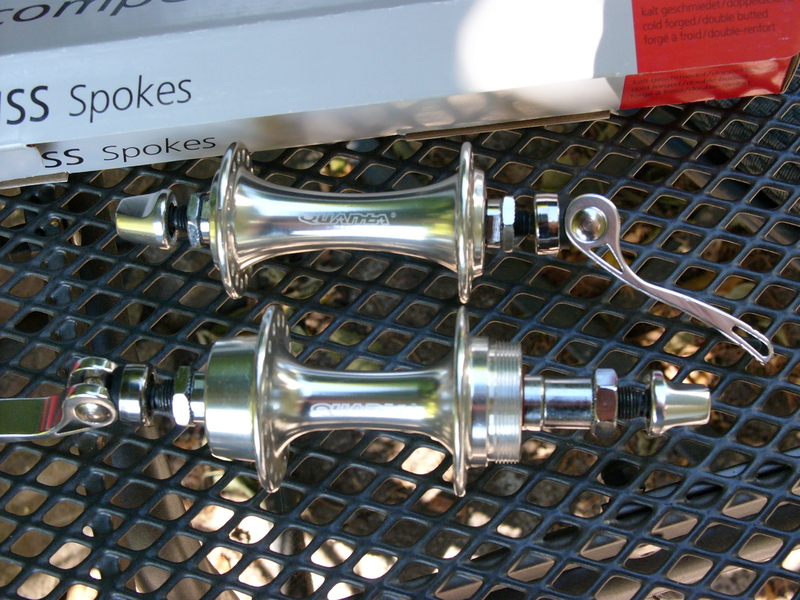 Thanks for your comments on cartridge-bearing hubs. I have a Royce that apparently no one can work on but the Royce factory, back in England! How many miles do you have on your CR18’s? The CR18s are holding up well. I’m not sure how many miles I’ve put on them, but they have been perfect for my winter bike. 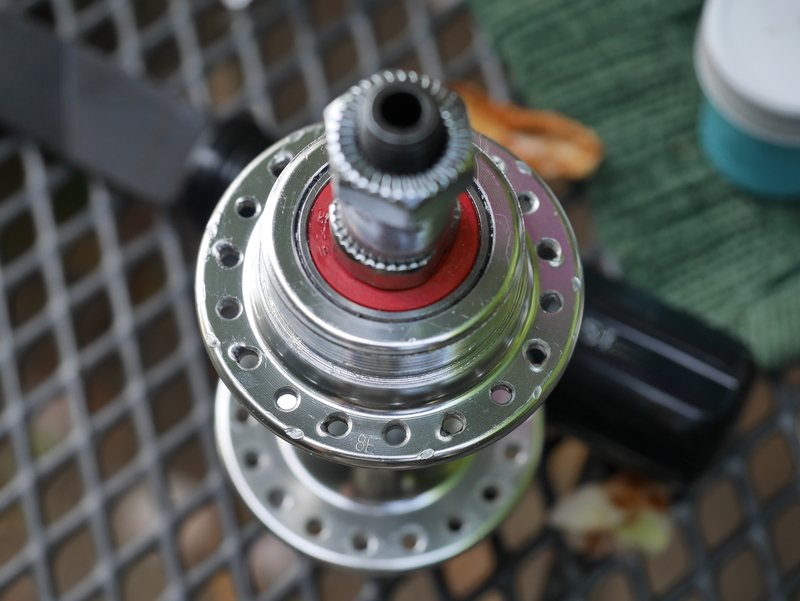 The grease in my Quando hubs was a clear variety, and seemed okay. I might try removing the cartridges by tapping out the axle, just to take a closer look. Really enjoy your posts…..and stories..and mishaps…very in formative….Thank You!!! Thanks, Cecil. In retrospect, I think the Paul’s chain keeper added to the damage. Without it, the chain would have stayed slack during this mishap, by falling off the chainring. 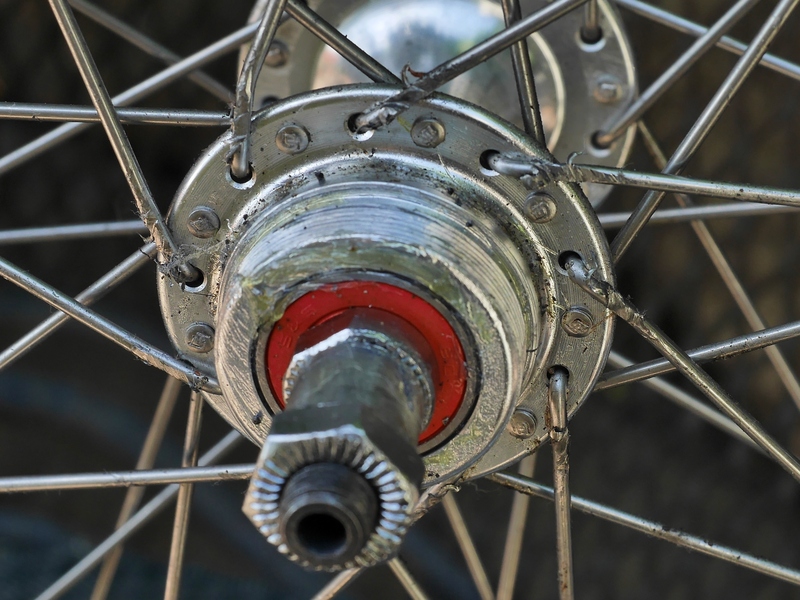 Instead, it got jammed against the chain keeper and applied enormous pressure on the chain – damaging all nine outer spokes, instead of just a few. Servicing cartridge bearing hubs is easy. You will need a vernier calliper to measure the spacing BEFORE you start to strip the hub. There isn’t any preload. The bearings are pressed in and the washers are thrust washers to prevent outward spread under load. The bearing on one side will come out if you strike the axle with a soft faced hammer from the opposite side. Use a soft faced hammer to prevent damage. You would be best to use a blind bearing puller. Check you bearing size, buy a set with the size nearest you need and the specifc size you need from an automotive tool shop. Often cheaper and better quality than those sold as bicycle specific. Enduro sell a bearing press, with a range of collars for different size bearings. Good quality tools prevent damage and are cheaper in the long run. Remember, it is common sense. Most of this stuff is assembled in Asia with unskilled labour.